Filed under: dinner, recipes, autumn, beer, stew, winter. On a cool autumn night, nothing tastes better than a hearty bowl of beef stew. I made an awesome stew the other night. Not a lot of ingredients. You can cut your prep time by buying stew meat, but the pieces they give you are usually leftovers and trimmings from other cuts, and come in unusual sizes. By cutting your own cubes from a boneless roast, you can control how much fat remains, and you can cut the pieces in more uniform sizes. 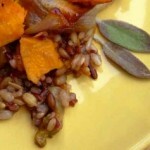 (Don’t cut off all of the fat from the meat, since it provides flavor.) 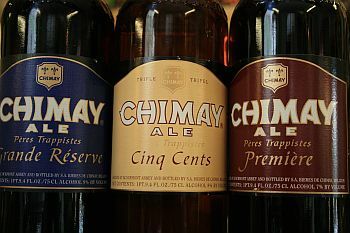 As for the cooking liquid, I prefer Chimay Trappist Ale. I think it adds just the right flavor without adding too much bitter flavor, but you can obviously use any quality ale you want. You can substitute any vegetables you want, though I think the onions are essential. Cubed turnips work well. Preheat your oven to 300°. Meanwhile, cut the roast into proper 1-inch pieces as described above. Season with salt and pepper, and toss in the ½ cup flour to coat. In the bottom of your heaviest dutch oven, brown the meat in small batches with the olive oil, being careful not to crowd the pan, getting a good golden brown crust. Discard the oil between batches if the bottom of the pan is getting too scorched. Slice the onions, and peel and slice the carrots, parsnip, and garlic, and brown them in the pot, adding a little water to help get the bits off the bottom. Add the tomato paste, and cook that for a few minutes, so it’s spread all throughout the vegetables. Now add the spices, the browned meat, and the bottle of beer, and bring the whole thing up to a rolling boil. Tightly lid, and put it in the oven to braise for 1 or 2 hours, until the beef is very tender, checking occasionally to make sure the liquid hasn’t bubbled away. Mix the remaining flour and the butter to make a paste — this is called a beurre manié — and stir that in to thicken. Remove the bay leaves, and check for seasoning. You can optionally garnish with lemon zest. Serve over egg noodles or with a crusty loaf of bread.